Local planners should take into account their role in the national logistics network when they are expanding their housing stock, a new report says. Communities secretary James Brokenshire has evoked the 'spirit of Britain's post-war push' to publicise the Government's housebuilding programme. The majority of British adults think Boris Johnson’s bridge proposals are ‘vanity projects’ and prefer investment into underground systems in major cities. New research shows that the majority of people support the building of new homes but oppose developments being located on green field sites. Future transport projects in London could be undermined if politicians fail to engage with the public, a major infrastructure firm has warned. Councils are increasingly adopting a ‘risk-based’ approach to filling in potholes, an analysis of council response times to calls about road defects has found. A £70m cash injection from Homes England will bring around 8,500 new homes and up to 3,000 jobs to Northamptonshire. The roll out of infrastructure for electric vehicles risks exacerbating the divide between rich and poor, creating ‘a tale of two cities’ in urban centres, a think tank has warned. Sheffield CC has acknowledged the need for a new phased approach to street tree replacement as a result of the ongoing controversy over tree felling. Secretary of state for transport Chris Grayling has officially opened London Luton Airport’s newly-upgraded terminal after a three-year transformation project. A cycling charity has called for an ‘overhaul’ of the UK’s cycle network, a move they argue could help add nearly £8bn to the economy. Local leaders in the West Midlands will this Friday consider plans to invest £43m in projects designed to tackle the region’s congestion problems. Sheffield City Council has tabled a proposal to save 300 trees and ‘phase the work on others’ in an effort to end the long running dispute over tree felling. Research finds councils are not spending on local infrastructure. With such a complex fund raising system in place it's hardly surprising, argues Hannah Vickers of ACE. The majority of those working in the road signs industry have concerns with the new legislation governing the designs and conditions of use for traffic signs. Only a small minority of local authorities have plans to support the 'last mile' stage of online shopping deliveries, according to a new report. London’s growth in business rates will be used to fund eight projects to improve the capital’s digital infrastructure. Courts of Justice today ruled that all six legal challenges brought against the decision in June to back a third runway at Heathrow can go to a full hearing. Driverless vehicles could lower need for private vehicle-use and free up thousands of hectares of land for development, according to consultants. Gloucestershire County Council has appointed Ringway Infrastructure Services to deliver a new multi-million pound highways maintenance contract for the county. Oxfordshire County Council has approved plans to borrow £120m to repair roads and other council assets. The two councils covering Oxford have struck a deal that will see the city council provide routine highway maintenance services on behalf of the county. Local authorities will be able to accurately record and share data on roadworks, after the Government pledged to invest up to £10m in a new digital system. Business leaders have warned of a ‘two-speed’ England unless the Government adopts a coherent approach to improving infrastructure. A council near Heathrow has submitted proposals to ministers for a £375m light rail link to the expanding airport. A UK company developing technology for driverless vehicles has started data gathering in two London boroughs as part of its plan to trial a shared driverless passenger service in London next year. York Central Partnership has submitted plans to transform one of the UK's largest city centre brownfield sites, creating 6,500 new jobs and up to 2,500 new homes. Local authorities paid out more than £2m in compensation over the past year to pedestrians who have tripped on poorly maintained pavements. Oxford City Council has called on the Government to adopt a 10-point plan to tackle high air pollution levels which contribute to 40,000 deaths every year. What does High Speed Rail really mean to you? Craig Wakeman, programme manager for the West Midlands Combined Authority’s HS2 Growth Delivery team, explains the real impacts HS2 will have. Local authority leaders have welcomed the Government’s proposal to make full fibre broadband for all new build homes mandatory. Public finances continue to perform better than expectations, although total borrowing is up year-on-year even before the promised increase in health spending. Local authority leaders have called for more funding for local road maintenance as second quarter pothole-related breakdowns hit a three-year high. Britain has a ‘golden opportunity’ to switch to renewable energy sources without increasing the cost to consumers, a national commission has revealed. The Government today announced that it wants at least half of new cars to be ultra low emission by 2030 in an effort to tackle air pollution. Infrastructure output in the UK has only increased by £70 per person in the past two decades, new research has revealed. Is local government connected and ready for any situation? A Government decision to reject plans for the world's first tidal power lagoon in Cardiff has been slammed by local politicians of all parties including the Conservatives. A 'green corridor' will be created alongside the HS2 high-speed railway to create a network of environmental projects from the capital to the north of England, it has been announced. Anne Stafford explains why the outcomes of PFI projects have failed to keep pace with expectations. Local authorities are been urged to set up ‘Energy Boards’ and appoint an electric vehicle champion in a new guide out today. Council leaders have demanded new powers to stop lorry drivers causing damage to roads by ignoring weight restrictions. Electric vehicles have potential, but ensuring the infrastructure is available to support them is critical. Andy King, director of energy at Sweco, explains. Planners have called on the Government to focus more on transport-oriented housing developments as study reveals only half of new housing is built within 2km of a train station. Richard Watts explains how local authorities can take the initiative to install Gigabit fibre and roll out high-speed services at a regional level. Local authority leaders have called for ‘real investment’ into local roads as new research reveals drivers spent one million years on the road in 2016. The deteriorating rural road network is in danger of cutting off countryside communities, rural insurer warns. Delegates at The MJ Future Forum North event heard about a city-wide Internet of Things innovation by BT and partners, which will transform the public realm. Professor John Davies explains the benefits for Manchester, as a testbed city. Local authorities should place health practitioners in transport and planning teams to help integrate cycling and walking infrastructure, a new report has argued. London boroughs are set to deliver another 2,630 charging points in the next financial year, an increase of over 300%, according to a new survey. In his Spring Statement, chancellor Philip Hammond opened bidding on the remaining £840m from the Transforming Cities Fund for improving transport in English cities, boosted skills funding and pledged a consultation on cuts to VED for businesses that buy cleaner vans. Nearly 400 cyclists have been killed or maimed over the last decade due to poorly maintained local roads, new figures reveal. A coalition of organisations has written to Sajid Javid to urge him to strengthen cooperation on housing and infrastructure between local government tiers. Investment potential shifts away from the South East as structural weaknesses around housing and infrastructure threaten UK’s most established centres, report says. Seven councils in south Essex have taken the ‘momentous’ decision to form an association to give the region a national voice. The first wave of the £5bn Housing Infrastructure Fund has been allocated to 133 council-led projects in England to deliver up to 200,000 new homes. Transport investment in London is five times more per capita than in Yorkshire, the Humber or the North East despite Government claims, new figures reveal. London and its neighbours need ‘greater collaboration’ across borders in order to respond to the housing crisis and other challenges, think tank says. Northern leaders today published their draft strategic transport plan which aims to ‘transform’ transport and close the economic gap between North and South. The Department for Transport (DfT) has committed nearly £50m to fixing potholes as part of a multi-million pound investment aimed at improving England’s roads. The Government estimates new plans published today to improve the country’s infrastructure and boost the construction sector’s productivity could save up to £15bn. More than half of people in the UK rank housing as the most important investment priority for the country, infrastructure specialists say. The Housing Revenue Account cap will be lifted for councils in ‘high-demand areas’ and stamp duty will be scrapped for most first-time buyers, chancellor Philip Hammond announced in his Budget speech today. The chancellor has announced that he is extending the National Productivity Investment Fund (NPIF) to boost transport and infrastructure. Prime minister Theresa May was today announcing major new government backing for UK research and development in industry and transport between cities. Council leaders have welcomed plans for a major development in the area between Oxford and Cambridge which is estimated could add hundreds of billions of pounds to the national economy. Scotland’s largest city is likely to ‘reap benefits’ worth £150m thanks to the millions the Government has invested into the city’s digital infrastructure and open data. Former convenor of Edinburgh council’s transport committee has said councils should not take on large public procurement projects like the city’s tram network. The majority of local authorities in England wish to prioritise access to walking infrastructure, but only half feel that developers share this view. A Yorkshire council has been landed with a repair bill of over £50,000 after a car show damaged a newly resurfaced road. Council chiefs have urged the Government to spend the over £400m extra raised each year through rising fuel and motoring taxes on improving local roads. Chancellor Philip Hammond is expected to announce an extra £400m for the north of England at the Conservative Party conference today. A ‘sense of place’ must inform the Government’s new life sciences sector deal, says think tank. Oxfordshire has been given a £6.2m funding boost from the Government to help unlock 15,000 new homes and improvements to local transport in Didcot Garden Town. 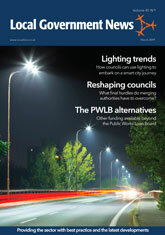 Paul Haddlesey sets out why local authorities should ensure street lighting infrastructure can adapt to future data input needs. The Government has announced 19 road improvement projects across the country will receive a share of £75m. A think tank has slammed successive Governments for leaving the North underfunded compared to London in what they describe as a ‘national scandal’. Councils in the south east are calling on the Government to provide more infrastructure investment after figures suggest the region is falling behind London.